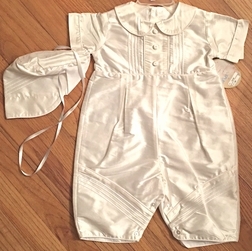 A sweet, sweet Christening Baptism outfit for baby boys made in off white silk. 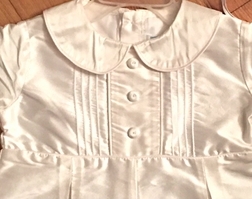 The romper has a Peter Pan collar with pin tucks down the front and 3 little buttons. Pintucks also embellish the legs of the romper. 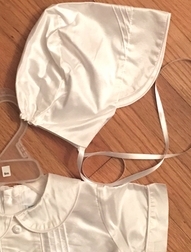 It comes with a matching hat that ties at the chin.